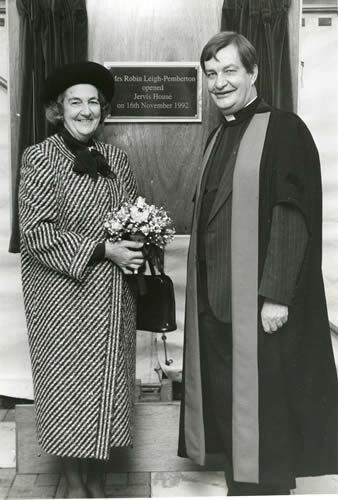 The opening of Jervis House by Mrs Robin Leigh Pemberton (later Lady Kingsdown) in 1992. Jervis House is a purpose built girls’ house, which was opened in 1992. It is named after OKS Douglas Jervis and his sister Norah Jervis. Until 1996 it included the cottages that were formerly Broad Street House. Girls had lodged here since 1978. It now incorporates the adjoining Malvern House and since 2013 part of Bower House. Until 2005, the only access was from Broad Street. Now there is a door through the Victorian section of the City Wall opening directly into the House.